We’ve all been there. We reached the final year of high school and discovered the college, the school, the job, the career that we wanted, and we attempted to move forward. We did everything we thought we needed to do—and more—to ensure that we would land one of the open seats in the version of the future that we wanted most. But sometimes, that “more” becomes problematic; we go in too deep, lose ourselves along the way, perhaps do some things we wouldn’t normally do—or for reasons we wouldn’t have previously considered. 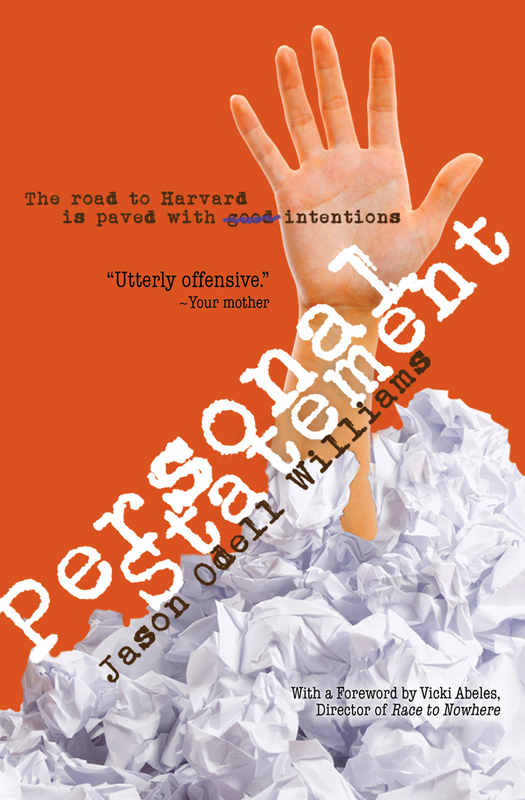 Jason Odell Williams explores these potential problems as he leads us down four very unique paths toward Ivy League schools, scholarships and higher positions on the corporate (or, in this case, political) ladder. When I first started reading Personal Statement, I thought I would be reading four accounts of completely separate lives that only shared the difficult acts of writing the personal statement and applying to the “right college.” But it proves to be much more than that. These four characters either know one another or meet over the course of the journey, reminding us not only of how small the world can be but, perhaps more importantly, how our decisions impact others. Two of the main characters, Emily and Rani (pronounced “Ronnie”), are best friends on very different paths (though this is unknown to Emily Kim): Emily being the overly-driven, all-that-matters-is-getting-into-Harvard-no-matter-the-costs high school senior, while Rani is more or less burnt-out, looking for a much more easy-going, fulfilling, perhaps equestrian, lifestyle. Then there’s Robert, a homosexual African American student who wants only to start over in Europe, rather than pursue the college of his family’s choice; also, he met Emily previously at a student program, beginning first as friends, only to let their competitive natures get the better of them. Last, we see A.J. (or Alexis), a mid-twenties woman who has already gone through the personal statement process but who finds herself throwing herself into a new job suddenly, in the hopes of getting her foot in the door at the White House, which involves interacting with these teens directly over the course of a weekend. Each of these four find themselves looking for that final leg up, something to help them stand out—maybe some unique volunteer work? A hurricane blowing into Connecticut, perhaps? Yes, exactly. So we find these four characters colliding in a small town in Connecticut, offering up their (kindest? most sincere? intrinsic?) services, with the thought in the back of their minds of using this experience for a resume, personal statement or future job application. This is where the heart of the story is, where the sentiment is at its most complicated: we’re watching four people who want something so much that they are willing to do something wonderful (volunteering to help those in need at a potentially dire time) for the completely wrong reasons. So then we’re forced to ask the question, “Can performing a good deed ever impact our character negatively?” I feel Emily, Rani, A.J. and Robert spend much of their stories interacting with and answering this exact question, determining what can result from misplaced intentions, or perhaps wanting the wrong thing—or wanting something far too much. Jason Odell Williams’ debut novel, Personal Statement, is a fine piece of young adult literature, teeming with humor and wit, and asking major questions about motive and priorities, as well as engaging with some of the more interesting developmental questions that come with adolescence (see, perhaps, James Marcia’s developmental model, which I couldn’t help but constantly think back to while reading these characters’ journeys). Rotating between characters chapter-by-chapter, I found this to be a difficult one to put down, wanting to continue listening to one character’s journey, and later marveling at their interconnectedness toward the end. Perhaps there will be some parents who will take offense at this, but I agree with earlier reviews that see this as a must-read for graduating seniors, their parents, and even their school counselors who may or may not assist in the college application process. Sometimes we have to slow down and reconsider our desires and how they are prioritized and what we’re willing to do and who we’re willing to be to gain those desires—and Williams’ novel is one to encourage just that. JASON ODELL WILLIAMS is an Emmy Award-nominated writer & producer of the television series, “Brain Games”—the highest rated show on the National Geographic Channel. As a playwright, his work has been produced at regional theatres across the country and in New York City. Originally from Columbia, Maryland, and a graduate of The University of Virginia, Jason lives in New York City with his actress-singer-director-producer wife, Charlotte Cohn, and their daughter, Imogen, who is working on her hyphenates as we speak. Personal Statement is his first novel. For more please visit his website. Previous Receiving an Honorable Mention for My Chapbook! !